Hall of the Mountain King: Review: "Ronnie James Dio: This is Your Life"
Of the 13 covers on Ronnie James Dio: This Is Your Life, three are previously released. Far and away the best of these is Adrenaline Mob’s cover of Sabbath’s “The Mob Rules.” Russell Allen delivers a scorching vocal on the song for one of the best performances here. Doro Pesch’s slightly more symphonic version of “Egypt (The Chains Are On)” will be familiar to many metal fans. It’s a solid take on a Dio deep cut from The Last in Line. And finally, the less said about Killswitch Engage’s cover of “Holy Diver,” the better in my opinion. I didn’t like it when it was released, and it hasn’t gotten better with age. I seem to be in a minority with that opinion, though. 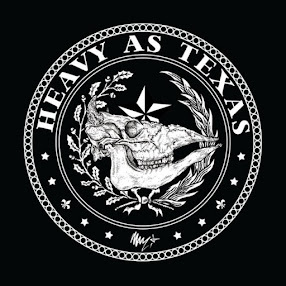 The other 10 tracks are brand new and feature both more modern bands and some true legends of the metal world. The most surprising performance for me was Slipknot’s Corey Taylor taking on “Rainbow in the Dark.” To say I’m not a fan of Slipknot would be putting it mildly, and I know Taylor’s done some more melodic work with Stone Sour, but I didn’t think he could pull it off. In fact, it’s one of the better versions on the record. The instantly familiar synth line of the song is converted to a guitar riff with a heavy delay effect by Steel Panther’s Satchel, and it works like a charm. Taylor is no Dio (who is? ), but he impresses and leaves me with a bit of a new respect for him. The other relatively new act on the album, Halestorm, tackles “Straight Through the Heart,” with mixed results. Musically, it seems to be lightened up and loosened up a little. Those big, crunching power chords of the original seem to lose some of their power in this quieter version. Singer Lzzy Hale does a pretty good job on the track, though. Comedic duo Tenacious D, who have a relationship with Dio going back to their early days when they wrote a song demanding that he pass the torch, give a surprisingly straight version of “The Last in Line.” Jack Black, of course, goes a little over the top on his vocals, and the guitar solo is replaced by … is that a flute? (Sorry, I’m a metal guy and not up on my wind instruments, but it’s some sort of pipe. Could be Zamfir on the pan for all I know.) Otherwise, the song is about as sincere as Black and Kyle Gass ever get. The tribute brings out a who’s who of metal royalty, too, including Judas Priest’s Rob Halford, Motorhead, Glenn Hughes, the Scorpions and Metallica. There are a few struggles even for the seasoned vets. Halford offers up a solid version of Rainbow’s “Man on the Silver Mountain,” but it just doesn’t compare to the original. Hearing a voice like Halford paling in comparison, though, really serves to underscore just how big a voice Dio commanded. The Scorpions turn “Temple of the King” into one of their ballads, for one of my least favorite moments. I almost expected Klaus Meine to come in whistling a la “Winds of Change.” In fairness, though, that is my favorite Rainbow tune, so anyone who took it on was going to have a problem gaining my vote. Metallica, normally a great cover band, struggles a bit on “Ronnie Rising,” a nine-minute medley of Rainbow tunes. Musically, it’s solid as usual, but James Hetfield is just hopelessly outmatched on the vocals, which I’m sure he’d admit himself. “Kill the King” works better than the other songs. I have to admit that I’ve liked the medley more with continued listens, though, and it will likely end up in the win column before it’s all said and done. We get big blues rock moments from a couple of other Rainbow tunes. Motorhead offers a rollicking version of “Starstruck” with Saxon’s Biff Byford on vocals. To be honest, it might have been interesting to hear Lemmy bark out the tune, but he only makes a background vocal appearance. Byford fits the song, and it’s a really nice version. A bit more impressive though is Glenn Hughes’ soulful rendition of “Catch the Rainbow.” Backed by veterans of Dio’s band Craig Goldy, Rudy Sarzo and Simon Wright, Hughes gives a soulful and understated performance of the bluesy tune. He doesn’t try to go toe-to-toe with Dio, but rather makes the piece his own. I’m also pleased to see the criminally underrated Sabbath record Dehumanizer getting some love on this compilation. Oni Logan (Lynch Mob, Dio Disciples) drops a faithful version of “I,” my favorite song from the 1992 reunion album, backed by some of his fellow Dio Disciples members and former Dio band members. The collection closes on something of a somber note with the man himself — the title track of the compilation, taken from the 1996 album Angry Machines. I’ll be up front and say that I haven’t listened to Angry Machines in a lot of years, and I consider it one of Dio’s weaker records. On the other hand, it allows me to approach the song with a bit of a fresh ear. It’s a song that’s pretty different for Dio, a symphonic piano ballad that really puts me in mind of Queen. It might also be one of the most heartfelt performances of his career. Maybe I need to dust off that old album and give it another listen. 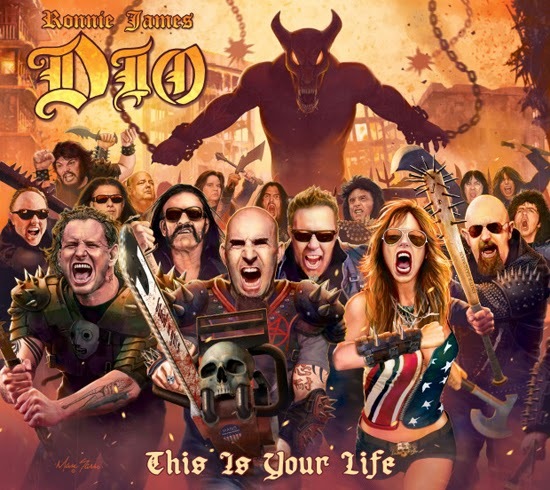 As with any tribute project, there are a few missteps on Ronnie James Dio: This Is Your Life, and the covers, no matter how talented the performers, have a tough time standing up to the power and voice of Dio. Taking that into consideration, though, this is an outstanding tip of the hat to, in my opinion, the greatest metal vocalist ever — and particularly with proceeds going to the Ronnie James Dio Stand Up and Shout Cancer Fund, it’s definitely a worthy way to spend your cash.